Let me start by saying a know nothing about what I’m talking about. Nothing. Nada. Niente. But then again, that’s why I like learning with kids. I’m not a teacher. I’m just the oldest learner in the room. That being said, our maker club is taking off. We’ve spent a few weeks learning some basic 3D design and looked at different ways of articulating those designs. We’ve kept our 3D printer running pretty much constantly for the last 4-5 weeks. This week, we’ve embarked on some bigger, longer term projects. One group is building a geodesic dome. I’m a drummer, not a mathematician. I understand the basic concept that a geodesic dome is a pattern of almost identical triangles arranged to create a sphere or hemisphere. But once we start to scratch the surface, we find out that the math in figuring out the “almost” part is where the fun begins. Thankfully, the group working on the project has some serious math smarts (and the help of a web based dome calculator) and are planning to build a hemisphere that is tall enough for a any of the maker club members to stand up in. Finding the lengths of the struts is pretty easy, with the use of the calculator. The angles where the struts intersect are more of a problem. We have two options here: we calculate the angles and make connectors at those angles or, build a connector that is adjustable on the 3D printer. We are looking at designs and tweaks to figure out what direction we want to go. A second group is looking at taking an X-Box Kinect and using it as a 3D scanner. Once they’ve figured out the technology, they want to use the scanner to scan their own images and the images of a few people outside of the team. How they use these images is still up in the air, but printing them is certainly one option. They are also talking about taking one of the images, scaling it up and perhaps creating a large cardboard sculpture. Who knows where else they might go with this! 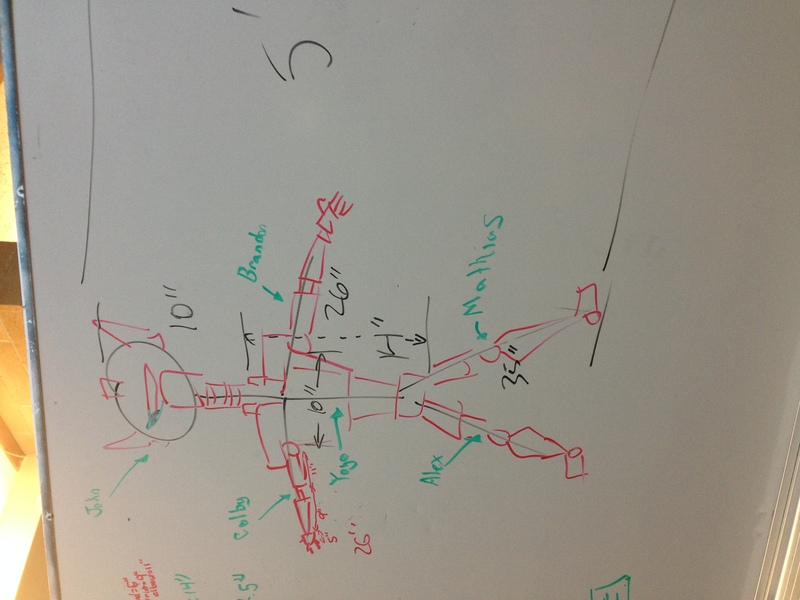 A third group decided today that they wanted to build a 3D printed mech (a mechanized warrior or military robot). Yup, I work at a boys school! On one level, this is no big deal. If you recall my previous post about the maker club, there was a picture of a small mech model printed. These guys are going big. They are wanting to build it 5 feet high. 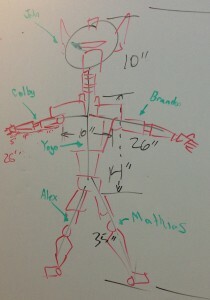 They measured one of their team members to get the proportions right and split up the limbs, torso and head for each of the six team members to design. There are all sorts of challenges in this. Obviously, we can’t print the mech in one piece, so we will have to build the parts separately and find a way of assembling them. In fact, most or maybe all of the parts will need to be printed in sections as well. We’ll need to figure out how to fasten all the pieces together, even though they’re being designed by different team members. I see a lot of challenges here, but none that are insurmountable. I look forward to seeing the final product! I love the direction that this is going. So many questions. So many problems to be solved. But all in the spirit of genuine curiosity, inquiry, and fun! This is perhaps one of the most exciting initiatives to have started at Saints throughout my time with the school, both as a student (and now alumnus). Hopefully it will drive a new wave of grads interested in innovation, and on a personal level, the curiosity and urge to learn. Saints and the community would do well with more individuals like this. Would love to stop by your workshop some day. Congratulations for bringing this to the school! Fantastic – will likely visit early next year. Will drop you a line beforehand.